Hello every one today I have a Christmas layout for you and some gift tags. This layout is of my baby number 3 merely a few months old. When he was born I was not a scrapper so I relished the opportunity to scrap this photo. I have gone vintage with my theme with touches of gold. The paper strips including hand punched scallop border I have attached with the Premium Craft Glue. For the layering of the cardstock die cuts I have attached again with the Acid Free glue but for the chipboard frame and deer I have attached with the Premium Craft Glue. The gold glitter paper pieces (again I have used a variety of punches and cut file elements) I have attached with the Premium Craft Glue, I love that no matter how fine your work is that when using this glue it dries clear! For my wood buttons I have used the PVA glue for strength. I love making Christmas tags for my gifts, they are simple and quick to make but really add that personal touch. I have used cream card stock to create my tags. I have cut two per tag and used Helmars Premium Craft Glue to attach. This way you can sew but still have a neat back tag to write on. I added a Christmas green paper which I have sewn on to create texture and interest. I then splattered gold paint over the tags and inked the edges of my tags to age them somewhat. I used gold glitter card stock to create my embellishments using cut files but of course you could use punches or ready made embellishments. I have used Helmars Professional Acid Free Glue to attach my gold embellishments to tags. The Professional Acid Free glue is ideal for Scrapbooking as it has a neutral PH and therefore your treasured memory keeping will not be adversely affected by time. The tags below I have used 2Crafty Chipboard stars and deer. I have also used flair buttons to finish off. Simple yet stunning to add to your gift wrap. I used Kraft cardstock and splattered in white paint to create a 'snow' look. Helmars PVA glue is excellent to attach the chipboard to any surface. I have used the Premium Craft Glue to attach the flair buttons. Thank you for stopping by today and I hope this has inspired you to create your own Christmas layout and some home made gift tags. Using the right adhesives is imperative and sometimes the one glue will not work with various types of materials used. I hope you all had a very safe and happy Christmas. See you in the New Year! Hey everyone, Lydia back today to share a fun mini project. Today I am sharing a Bucket List Mini Album using Project Life cards. Now I was to feature playing cards like this album below but unfortunately I didn't have them so that is why I am using Project Life cards. So you could make this project with either playing cards or project life cards! First of all I started by picking out some Project Life cards. now I back each one back to back with another so make sure you have enough picked out. I then journaled my bucket list on some of the cards and then punched a whole in the top corner of each card so that the book binding ring can hold all the cards. I then added some embellishments to a few of the cards. And here is some close ups of the finished project. I hope you enjoyed this little project and I will be back soon with another creation! If you're not all Christmas crafted out...then this is the perfect project for you this weekend! Today I have a handmade ornament which is easy to make for family and friends! Get out those old scrapbook papers, paints, inks and small canvases. I cut out poinsettia leaves from different green papers and Decoupage them to the canvas. Decorate as you wish adding paint and stamps. Add berries using Helmar Gemstone Glue. I stamped the words on a sheet of paper and also Decoupaged them to the canvas. Doodling finishes the look. Attach ribbon or twine to the back using with Quickdry 450. Here is my finished ornament! These are such fun to make and give. Thank you for joining me and I would love to see any ornaments you make! Share them on our Facebook page. It's Krisy back today. It's holiday/party season with Christmas being only a few days away but for our family party season is birthday season. My eldest daughter is a Christmas Eve baby. Since the day she was born we made a pact that we would make sure that she gets to celebrate a birthday without Christmas taking over. There are no combined presents, cards or celebrations. Everyone in the family was warned of these rules right from the minute they came to visit her in hospital. Each each year I do a theme for her party. The first year I kept is simple as we had 2 parties (one for friends and one for family)... it was pink, white and purple. The second year the theme was woodlands and the third Monsters Inc. This year she is four. And she had a little bit of a say in what she wanted. FROZEN. I always buy bits and pieces and team them up with handmade bits and bobs whether it be pom pom garlands or bunting. This year, I got to work making decorations and a costume for my husband. I'll get to the costume after the decorations so keep reading. This is the perfect activity to get the kids involved in and they are perfect Christmas decorations too. You then need to squash the rolls flat and cut them into strips across the tube. I forgot to take a process shot of this part but in the next photo you will see what I mean. Then I took my Helmar Craft glue and glued them all together in snowflake shapes. I started by gluing six together in a flower shape and then adding folded ones between the edges for a more snowflakey feel. Once they had dried, I painted them with 2 coats of white acrylic paint. Then I added more glue and dipped them in glitter. I only did the sides, one because that is all you really need to do and two I had glitter everywhere. I tried adding glue directly onto the edges and it worked by the best way I found was to spread some glue out on your desk, dip the snowflake and then dip it in the glitter. Much like when you batter something. Think of the glue as the egg white and the glitter as the flour. I used a few different colours of glitter in silver, white and blue. This is my tried and tested best dipping process in photos. What I did with all the finished snowflakes we created was I hung them in strand using bakers twine. They would look great hung from fishing wire too but bakers twine is what I had on hand. One they were tied in strands, I hung them from the rafters of my back deck. I made long stands by tying them one under the other. (My Mother in Law even commented that they would be great Christmas decorations....I know!! Hence the reason they will remain hanging for another week until Christmas. Thanks for that :P) They were a bit hard to photograph as strands as the background was too busy so here is an individual one. If you look really hard amongst the silly string and the crazy family in the next photo, you can kind of see the snowflakes hanging in the background. I made these over a few months. You need roughly 3 or 4 toilet rolls per snowflake to make a decent sized one. So this is a project best planned ahead! Now for part 2 of my blog post....Kristoff! I cheated a bit and bought my own Anna costume and all the kids something special to wear but do you know how hard and expensive it is to purchase a Kristoff outfit?! It's ridiculous and here in Queensland, Australia it is a million degrees around Christmas time so I had to think of something that was kind of cooler and my husband wouldn't complain about wearing. I spent a long time thinking about this and was almost ready to make something from scratch when I had a crazy idea...I could turn a t-shirt into something pretty close to the real thing. It was so simple to make. Seriously, anyone could do it. Clips are not necessary but I thought I would need them at the beginning. The picture of Kristoff is off one of the table cloths and was my guide. I picked up the shirt from K-mart for $10 and the trim was on sale for $5 and the fur only cost me something like $3. So far I am less than $20 and the cheapest "Winter" costume I could find with postage was up over $100 so I am winning. To start I just laid the shirt out flat and roughly marked out where I needed to alter the sleeves, collar and waste. This is what the marks looked like before I cut them out. Once it was all cut out I just used my Helmar Fabric glue to stick on all my fur and trim. To make the edges a little more stable, I folded them over about 5mm and glued them and then glued the fur trim to the inside. In this picture you can see the thicker edge that I am gluing the trim too. And this is what it looks like close up and finished. I did have clips out to hold things in place but I didn't need to use them. I was worried about the glue seeping through the thin cotton of the shirt so I applied a bit but not too much. I think the hot day helped the glue to dry very quickly. So, if you are going to try this, I would suggest you put a sheet of cardboard between the front and back so that they do not stick. Then I went on to glue on the trim. I used most of the 5 meters. I think there was less than 20cm left on the roll that my daughter claimed for her scrapbooking. The perfect Australian alternative to heavy Northern winter wear. And here is a photo of it in action. I'll be honest, I did not expect the fabric glue to hold up the whole day in 35 + degree celcius Queensland weather nor did I think my husband would wear it all day without complaining. But surprisingly it did and he did. The top knot of the hanging bit of the sash at the front did peel a bit by the end of the day from picking up the kids but overall everything held together. I was really impressed. So if you can't sew; don't dispair you can still create awesome outfits! Everyone was well impressed my my summer design and the fact the whole thing was just glued together. So, go get your self some Helmar's Fabric Glue and get making! Thanks for looking. Have a wonderful Christmas and fantastic New Year. I have made some decorations to sit on my shelf. They could easily be adapted to be hung on the tree or on the wall. This is out of more recycling of the wood off cuts that we get from a friend that builds staircases. List of items to make this project. First I sanded all the edges of the wood off cuts and painted the back and sides with Gesso. Then I painted the sides with True Red Decoart paint. Using some Christmas music themed paper I covered the front with Helmar Decoupage and Craft Paste and using the paint and glue spreader smoothed it out so there were no bubbles. I painted some book paper with some watered down Gesso. Then I drew a snowman and Angel and fussy cut them out. I pieced a tree together in some layers of different Christmas themed scrapbooking paper. I used some modeling paste at the bottom of the snowman and the Angel on the backgrounds to give it some texture and was going for a look of snow and a cloud. I painted the background added some rub-ons and drew some dangles at the top. Then I added my images of the snowman angel and tree with my Helmar Decoupage and Craft Paste and paint and glue spreader. I added the words with my Alphabet stamp set and added a bit of glitter to the stars. Hope you enjoyed my Christmas project. I enjoyed making these and adding my Grandmothers tiny Christmas tree in the photos. I love making gift card holders and small boxes! I jump at the opportunity to do so at any birthday and/or holiday! So let's skip right over to see my finished project, then I will be more then happy to tell you how I made it. This easel box card when at it's flattest is maybe 1.5 inches tall x 3.25 inches wide x 4.25 inches long. I will probably have to make a special box for it, if i send it in the mail, but I won't worry about that for now! Let's gather our supplies! I first measured out the base for my project with solid cardstock. I measured for a drawer, a drawer casing, the easel and the front placard for the easel. There are several tutorials on youtube that can show you how to make a one like this. I used the Helmar's Super- Tac Glue to adhere all my corners and flaps in place. Super Tac sets pretty fast, I didn't even need clips to hold my flaps in place. I also used it to layer my plain cardstocks! Then after creating my own dimensional patterned paper, I stuck that down with a heavier glue; Helmar's 450 Quick Dry Adhesive. I also used the 450 Quick Dry to hold my trim in place! I colored my reindeer with markers and paint. I also used a dab of Super Tac to stick down the embellishments I cut from some Christmas patterned paper! Since my trim had a bit of dimension of its own, I decided to pop up my little reindeer with a few Helmar's Scrap Dots. Yeah they are round, but if you only need a piece of one , you just cut it. As a matter of fact, I use all the remnants from the scrap dots too!! That's that! I am totally pleased with how this turned out. My mom is so pleased, she asked me to make several more!! We both know that using Helmar's Adhesives means that this gift card/box will stay in tact a very long time!! Well.. I won't see you guys before the holidays, so from MY FAMILY.. to YOURS.. MERRY CHRISTMAS and HAPPY NEW YEAR!!! To start off... 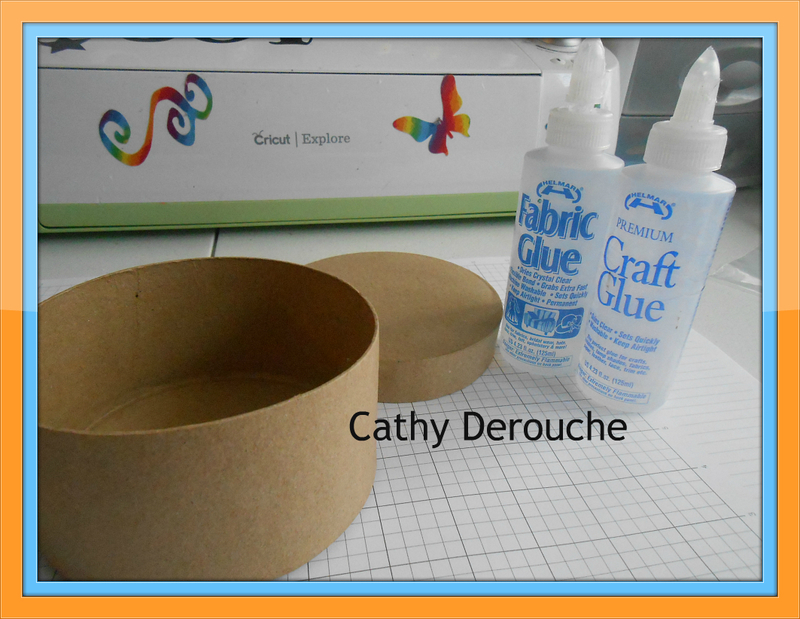 Here are 2 of the adhesives I will be using as well as the plain chipboard container.. Here are more of the products used..Craftwork Cards Christmas Cheer Ultimate Collection. 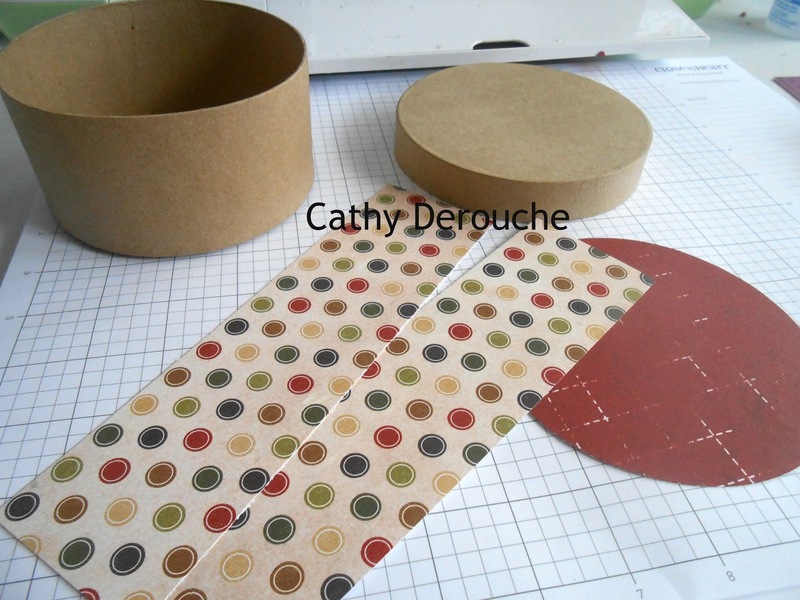 I started out by cutting some pattered paper to fit around the box and on the top of the lid.. The next step is to use the Helmar Craft Glue to hold the pattern paper on..
as well as the cover paper. Below I used the Tim Holtz Distress ink ~ Vintage Photo, to ink around the edges to give it aged look. 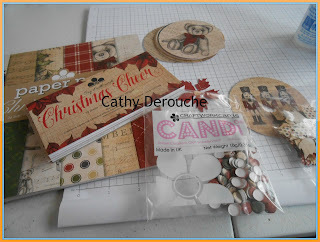 To embellish I used Helmar Zap Dots to add dimension to the round pop out card stock pieces. Here is the project assembled.. Of course I had to add something for my sweet tooth!! 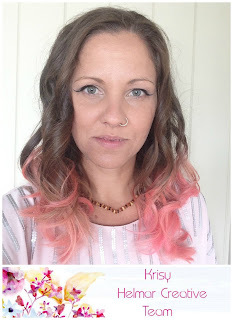 I hope you enjoyed todays' project and that I have inspired you to get your craft on!! I started with Heidi Swapp Santa Baby paper and placed the stencil to the right of the page; I used the texture paste on the stencil and sprayed over it with Helmar Crystal Kote Gloss Varnish and waited for it to dry. Then I coloured over the paste with a gold pen. After that I flicked Kaisercraft's red Kaiser mist over the page. I used Helmar Super-Tac Glue to place my picture in the middle of the page and added the Happy Holidays journaling cut out to the left of the picture. Then I tucked a few small pieces of paper behind both of them. For the banner at the top of the page and the ‘25’ embellishment I used Helmar Liquid Scrap dots for dimension. I finished with some banners at the bottom of the layout using Helmar Tacky Craft Glue. Then added the stars, buttons, enamel dots and sequins with Helmar gemstone glue; it’s so handy for small embellishments. I loved making this layout, I hope it inspire you to make a Christmas layout using these excellent Helmar products. Today I have a fun craft project for you and your family! Supplies include votive candle holders and/or recycled jars, salt, stencils, paint and Helmar Decoupage! I used table salt but Rock Salt would also be very pretty! Let's get to work! The first thing is to paint a design on the glass using the stencil. Allow this to dry. Now comes the fun and messy part.Apply a coat of Decoupage to the glass and then coat with salt. You might have to play with the glass to see what is the best way to apply the salt. It can be poured over, rolled in it, etc. Allow to dry. Salt will come off as this is handled so be sure to protect any surfaces before using it. If desired add decorations to the top of the jar. I added ribbon and an artificial pine branch. Once the candles are lit, you can see the design. Don't you love how they look? Crafting and recycling - a great family activity! Thank you for joining me today! Be sure to check out Helmar for all your adhesive needs! And don't forget to join us on Facebook for more inspiration and to share your ideas! Hello crafty friends, Sarah here with a little gift idea for New Years (actually this is a nice idea that could be given for any occasion!). Lets get started....a colleague of mine bought some yummy cheese to a team meeting.....whilst the cheese was delicious, I was eyeing off the little wooden box it came in. First step is to cover it using white gesso - this gives some 'tooth' for any paint to stick to. I then painted the box - I put on three coats to give better coverage. Now for the second layer of paint...using Dylusions Vibrant Turquoise, I applied this to parts of the box to give a more shabby chic look. I then did the same application some Inka-Gold in Iceblue. This gives a lovely silvery shine to the projects. Using a Kaisercraft script stamp, I used black ink to stamp on the box and on the doily that is to go on top of the box. I then sprayed the box twice with Helmar Crystal Kote Gloss Varnish spray. Then using the Helmar 450 Quick Dry Adhesive adhere the embellishments into place. I prefer using the quick dry adhesive so I can easily stick things down - this dries quickly and clear. In order to adhere the gorgeous silver peacock embellishment, I used Helmar Liquid Scrap Dots. I love these dots - they give the embellishment height and dimension. Finally, I adhered some flowers, gems and sequins.